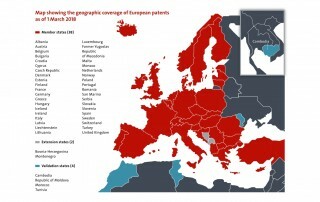 In addition to national phase patents filed in other countries, RefEDGE, LLC has filed in the European Union representing the 38 member countries. RefEDGE, LLC, makers of RefEDGE PRO vanishing referee spray and related referee products, holds pending patents in USA, Canada, Switzerland and other countries abroad as well. Their patents include protections for their proprietary Stand-and-Spray delivery method as well as their advanced holster and clip features. The Stand-and-Spray delivery method is unique to the world and allows the user (referee) to stand upright when spraying the formula. This delivery method combines proprietary formulation, propellant, valve and actuator to allow the spray to be used at a much greater distance than all others on the market while still maintaining a tidy, usable marking line on the field. In addition to the spray, RefEDGE has patents filed for protections of their versatile and fast can holster, the GRIPCAGE. Various features of the holster allow it to be easily locked vertically as well as horizontally as well as free swinging. 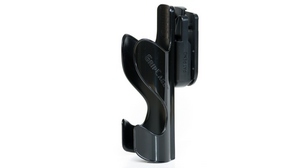 In addition to the mounting flexibility, the holster’s shape allows flexibility in how the can is inserted allowing for easy top entry by sliding it in from the top OR side entry by snapping the can in directly sideward while parallel to the holster OR tilting it in by “stabbing” the bottom of the can in the middle of the holster and tilting the top inward (the fastest way). 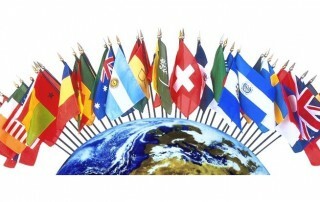 RefEDGE, LLC is a Maine company with customers on 6 continents. RefEDGE, LLC, makers of RefEDGE PRO vanishing referee spray and related referee products, has filed national phase utility patents in USA, Canada, Switzerland and other countries abroad. The filings are based on earlier provisional and PCT/WIPO filings and include protections for their proprietary Stand-and-Spray delivery method as well as their advanced holster and clip features. Their Stand-and-Spray delivery method is unique to the world and allows the user (referee) to stand upright when spraying the formula. This delivery method combines proprietary formulation, propellant, valve and actuator to allow the spray to be used at a much greater distance than all others on the market while still maintaining a tidy, usable marking line on the field. In addition to the spray, RefEDGE has filed for further protections of their versatile and fast can holster. Various features of the holster allow it to be easily locked vertically as well as horizontally as well as free swinging. In addition to the mounting flexibility, the holster’s shape allows flexibility in how the can is inserted allowing for easy top entry by sliding it in from the top OR side entry by snapping the can in directly sideward while parallel to the holster OR tilting it in by “stabbing” the bottom of the can in the middle of the holster and tilting the top inward (the fastest way). RefEDGE has released a pink version of their GRIPCAGE holster for the month of October and beyond. In addition to the new color, the design has been updated with a new outer edge for more comfort and a better, more refined look. Find the new item here. As always, the GRIPCAGE is offered in all colors to match your jersey. 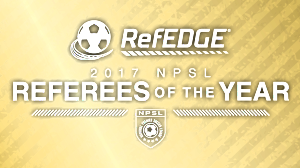 The National Premier Soccer League (NPSL) is proud to announce the four recipients of the 2017 NPSL RefEDGE Referee of the Year awards. Jeff Arthurholtz (Seattle, WA) has been named NPSL RefEDGE Referee of the Year-West Region and NPSL RefEDGE National Referee of the Year. Arthurholtz is a seasoned referee of 16+ years that has worked high-profile matches all over the country, including NPSL, NWSL, USL, and Men’s and Women’s National Team games. He has also officiated youth regionals and nationals as well as the Development Academy playoffs and finals. Outside of soccer, the Las Vegas, NV native works as a medical examiner for a company that covers all of the Pacific Northwest. Eric Tattersall (Greenfield, OH) has been named NPSL RefEDGE Referee of the Year-Midwest Region. He has been a registered US Soccer referee since 2009 through Pennsylvania West and Ohio South. In Ohio, he also is currently a state referee. In addition, he has been a NISOA registered college referee since 2011. Outside of soccer, the Erie, PA native is a middle school mathematics teacher in Washington Court House, Ohio. Leland Grant (Nashville, TN) has been named NPSL RefEDGE Referee of the Year-South Region. He has been a national referee for five years, but he also works full-time as a songwriter/music-producer. Thomas Snyder (LaGrangeville, NY) has been named NPSL RefEDGE Referee of the Year-Northeast Region. A certified referee and a licensed coach, Snyder worked with the New York Red Bulls Training Programs after college. He was encouraged to officiate higher level games and later became involved with the Eastern New York Elite Referee Program. Having the opportunities to attend events such as the Disney Showcase, the Development Academy Winter Showcase, the Development Summer Showcase and Playoffs, Region I Youth Regionals, USYSA Nationals, and Dallas Cup over the last few years has given him the opportunity to improve and become a better referee. The nominations were made by the US Soccer’s National Assignors who appoint officials to NPSL matches. These nominations were compiled and reviewed by a selection committee comprised by members of the NPSL and US Soccer. This committee selected the winner of each region and from those, the national winner. The criteria examined included not only their performance on the field, but also their contributions off the pitch. The wait is over! Announced at the NISOA annual convention, RefEDGE has released a black version of their GRIPCAGE holster. In addition to the new color, the design has been updated with a new outer edge for more comfort and a better, more refined look. Find the new item here. The other colors (and new colors coming) will also be available for the fashion-forward referee wanting to matching the holster to the jersey. On Wedenesday, RefEDGE, LLC, a Maine company and makers of vanishing referee spray among other products, extended their patents internationally to 151 countries. The filings are based on earlier provisional filings and include protections for their proprietary Stand-and-Spray delivery method as well as their advanced holster and clip features. Their Stand-and-Spray delivery method is unique to the world and allows the user (referee) to stand upright when spraying the formula. This delivery method combines proprietary formulation, propellant, valve and actuator to allow the spray to be used at a much greater distance than all others on the market while still maintaining a tidy, usable marking line on the field. In addition to the delivery method filing, another filing seeks protection for features unique to their can holster which allow it multi-function use. Various features of the holster allow it to be easily locked vertically as well as horizontally as well as free swinging. In addition to the mounting flexibility, the holster’s shape allows flexibility in how the can is inserted allowing for easy top entry by sliding it in from the top OR side entry by snapping the can in directly sideward while parallel to the holster OR tilting it in by “stabbing” the bottom of the can in the middle of the holster and tilting the top inward (the fastest way). In an effort to better promote, emphasize and educate about the exceptional features of the RefEDGE products, RefEDGE has created a YouTube channel dedicated to this cause. The first round of videos feature the versatility and use of the GRIPCAGE™ holster as well as the RefEDGE PRO™ spray in use. The videos of the spray show it being used on a rather windy day (12-15 mph) and the performance is still very impressive, especially considering it is being sprayed from a full standing position. A couple of the videos compare other sprays under these same windy and standing upright conditions – they did not perform well under these conditions. The day was also cold at about 42 degrees F. More videos are to come. RefEDGE invites YouTube users to subscribe to the channel by visiting https://www.youtube.com/channel/UCns27VyZ8oyeWKaJuD5PcZQ.